With the feast of St. Francis of Assisi falling an October 4th, it seems appropriate to find out just what the Franciscan life entails and why it continues to attract vocations even after 700 years. Nestling amongst the vineyards in the beautiful Beaujolais Valley?—the heart of the wine growing region of France?—is the little village of Villie Morgon. It is of interest to Catholics because here is to be found the “Couvent St. Francois”, the only Franciscan Capuchin monastery still completely faithful to the Rule laid by St. Francis. Following the Second Vatican Council and the ravages inflicted on so many religious Orders who felt they had to “update” themselves and become more modern to attract the young, the Franciscans too followed this line of thought. 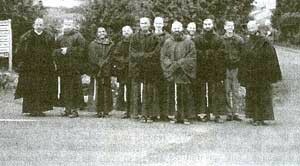 It caused great sorrow and hardship to many of the monks, especially the older ones including Bl. Padre Pio who, it is reported, even prayed that God would take him rather than that he should have to celebrate the New Mass under obedience. God heard his prayer and the holy man died in 1968 just before the New Mass was officially promulgated. Padre Pio belonged to the Franciscan Capuchins, a branch of the Franciscan Order so-called because of the hood they wear attached to the habit. The Capuchins are a contemplative Order who adhere to the strict Rule which St. Francis laid dawn in the twelfth century. 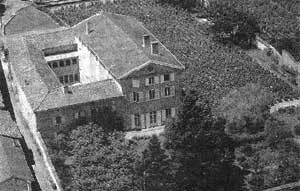 Much of the Rule has been relaxed since Vatican II and it was this which caused Pére Eugéne de Villeurbonne, then an elderly monk, to leave his Order, He stayed on his own for a while, faithful to his old Rule and then he decided to start a monastery which would follow the traditional Rule of the Franciscan Order. With the help of some sympathetic and dedicated laymen, he acquired the property in Villie Morgon which, ironically; was a former Masonic Lodge. All the masonic symbols had to be removed from the doors when the property was taken over and alterations done to turn it into the monastery it is today. To Pére Eugéne’s joy, the monastery soon started to attract vocations. At the present time there are 4 priests, 4 seminarians who are doing much of their studies at the Society of St. Pius X seminary at Flavigny and Ecône, and 3 Brothers. The monastery adheres to the Old Mass and the monks align themselves with the SSPX, having their priests ordained by the Society’s bishops. The Friars or priests celebrate Mass, preach, teach catechism and give retreats and missions, sometimes accompanied by one of the Brothers to assist them. The Brothers do the manual work about the property and are responsible for the care of the sacristy and the kitchen. Understandably, there is quite a high turnover of aspiring vocations as the life is hard but not impossible, but our modern youth have for the most part been brought up in ease and comfort and cannot imagine life without TV, radio car telephone and not even a car! Visitors to the monastery are impressed by the atmosphere of peace and tranquillity which they find there and also the happy dispositions of all the community. As one can see from their timetable, their life is one chiefly of prayer and work. For those of us who find it difficult to keep ONE Lent, the Capuchins have THREE: November to Christmas, from the Epiphany to just before Ash Wednesday, and from Ash Wednesday to Easter Saturday. Every Thursday the community goes on a 2 1/2 hour walk into the countryside. Once a year they go on a 3 day pilgrimage, walking all the way, to the Shrine of St. John Vianney of Ars. At least one member participates each year in the Chartres to Paris pilgrimage at Pentecost. Apart from some fresh produce obtained from their own land, the Capuchins are entirely dependent on the generosity of the faithful for their needs. Non-catholics and, unfortunately, even many Catholics too, tend to regard this type of vocation, cut off from the world and its attractions, as a waste of a life. But it is precisely the constant prayers and sacrifices which these contemplative men and women make which is most pleasing to God. Living as we are, in a world which has turned its back on God, these heroic people offer Him the honour, love and consolation which so many deny Him. Even devout Catholics out in the world cannot devote as much time to prayer as they would wish, and so these religious Orders make up to God a great deal for all that is lacking in others. It must surely be true that the world, bad as it is, would be infinitely worse off were it not for the fervent prayers of these dedicated religious. How many great saints have they not produced over the centuries, saints such as St. Francis himself, St. Anthony, St. Bonaventure, St. Paschal Baylon, St. Peter Alcantara, St. Francis Solano, St. Lawrence Brindisi, St. Joseph Cupertino, St. Didacus and lately Bl. padre Pio.